Among all porcelain produced in Jingdezhen, the most representative is blue-white porcelain 青花瓷 . 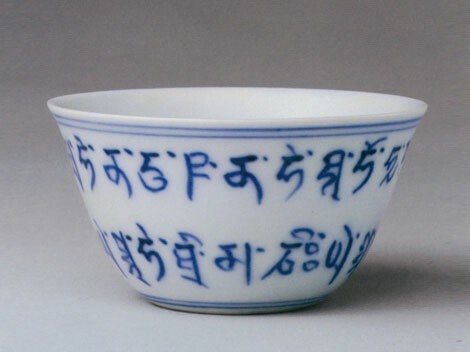 Baking blue-white porcelain originated in the Northern Song Dynasty (960-1127). During the Yuan and Ming dynasties (1271-1644), blue-white porcelain became increasingly popular, and since the 14th century, manufacturers have shipped blue-white porcelain to world markets. 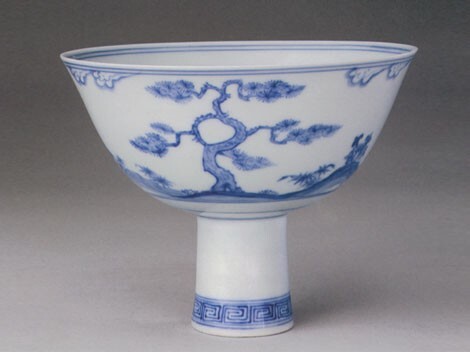 The porcelain reached its peak in the Qing Dynasty (1644-1911). Its thin, translucent quality and exotic motifs made it very valuable throughout Europe and the colonies, ranking first among blue-white porcelain nationwide. Drawing the design with a cobalt pigment onto the stoneware body and painting over it with a transparent glaze creates the blue-white style, also known as "underglazed blue". The piece is then fired at a high temperature. Blue-white porcelain was introduced during the Yuan Dynasty (1271-1368) and has been in production ever since thanks to its bright colors, simple yet elegant patterns, and smooth glaze that never fades. 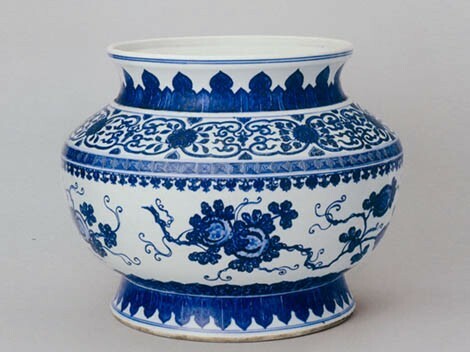 The Yuan Dynasty is a key period for the development of the firing techniques for blue-white porcelain in China. Its unique characteristics were based on the techniques of former dynasties. Blue-white porcelain had become a major porcelain product in China by the Ming (1368-1644) and Qing dynasties (1644-1911). 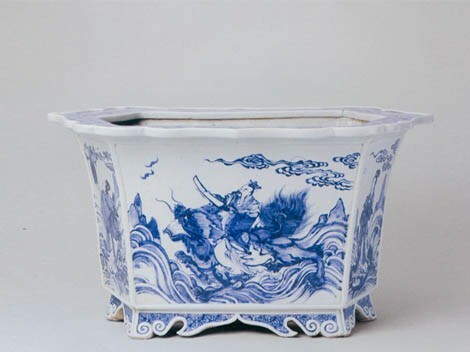 Blue-white porcelain of the Yuan Dynasty is large, with a thick roughcast. Generally, the works include big bottles, pots, bowls and plates, with the traditional flavor of the Tang (618-907) and Song (960-1279) dynasties. Due to the underdeveloped techniques, there are two interfaces on the body and several veins inside the body. The roughcast is not as smooth as that of the Ming and Qing dynasties and the glaze is thicker due to more iron in the raw glaze materials. There are bamboo-like lines at the foot of the porcelain. The body is connected to the foot before the glaze is coated. The body is decorated with lotuses, clouds and flowers. Dense decorations were not only applied to blue-white porcelain but also to picture weaving and stone carving, reflecting the unique characteristics of the time. The major producer of blue-white porcelain in the Yuan Dynasty was Jingdezhen. In addition, there were kilns for blue-white porcelain production in East China's Zhejiang Province and Southwest China's Yunnan Province . Blue-white porcelain actually belongs to color-glazed porcelain and the coloring agent used is called cobalt oxide. First, using cobalt oxide, paint the unbaked mould, then apply a layer of translucent glaze over it and bake it at 1,300 degrees Celsius. The cobalt oxide will be reduced under the high temperature into a blue hue, which will be very bright and durable without poisonous lead. Each piece of monochrome-glazed porcelain has a single bright color with an exquisite design. A very good mastery of controlling temperature changes and content composition is required. Blue-white porcelain is most famous among the four traditional types of porcelain produced in Jiangdezhen, and is renowned as the "ever-lasting blue flower." In 1979 Jingdezhen blue-white porcelain won a national golden prize and in 1985 it was honored with three gold medals at international fairs held in Leipzig, Brno, etc. Since then, the name "Jingdezhen Blue-white Porcelain" has spread far and wide. By far, it is a top product in the porcelain business, boasting the most prizes and highest standards.